I found this fantastic recipe for super crispy chips and wedges. They really do come out crispy crunchy and healthy. Add to saucepan of cold water and bring to the boil cooking for 15 minutes. Drain potatoes and cool slightly. Cut potatoes into wedges or slices. 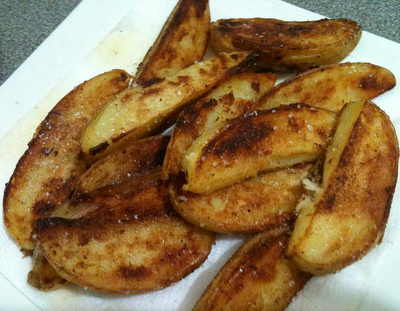 On medium high heat melt some margarine and oil in a large fry pan and sauté wedges until golden brown. Reduce heat to medium and cook for another 10 minutes or until wedges are crispy and soft inside. I found this Chocolate Chip Cookie Dough Truffle recipe a few months ago but have not been game enough to try it until last night. I can't even remember where I found it. Anyway it's a very naughty recipe but still good. It is for those days when you say to hell with it I want chocolate! The chocolate coating has a lovely crunch to it when you bite through it to get to the cookie dough centre. They are so fun to eat. Enjoy! Beat butter and sugars in a large bowl with electric mixer on medium speed until light and fluffy. Add soymilk and vanilla. Stir in flour, baking soda and salt and mix until combined. Stir in chocolate chips. Form dough into round balls and arrange on a baking sheet lined with baking paper. Place in freezer and chill for 30 minutes. Melt chocolate coating in a heat proof bowl over a saucepan of boiling water or as package directions. 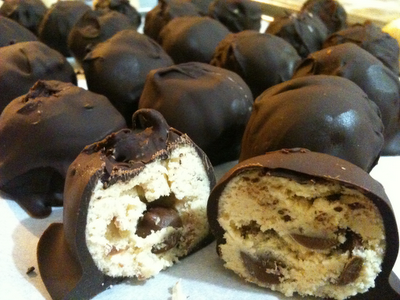 Using a fork or a dipping tool, dip cookie balls into chocolate to cover. Tap fork on side of pan to remove any excess coating, and return to lined baking trays. Chill until set. Store, in an airtight container in the fridge though good luck making them last that long! Even though I am lactose intolerant I still love chocolate and had a mad craving for Chocolate Chip Cookies. I actually found this recipe on my baking tray from Baker's Secret. 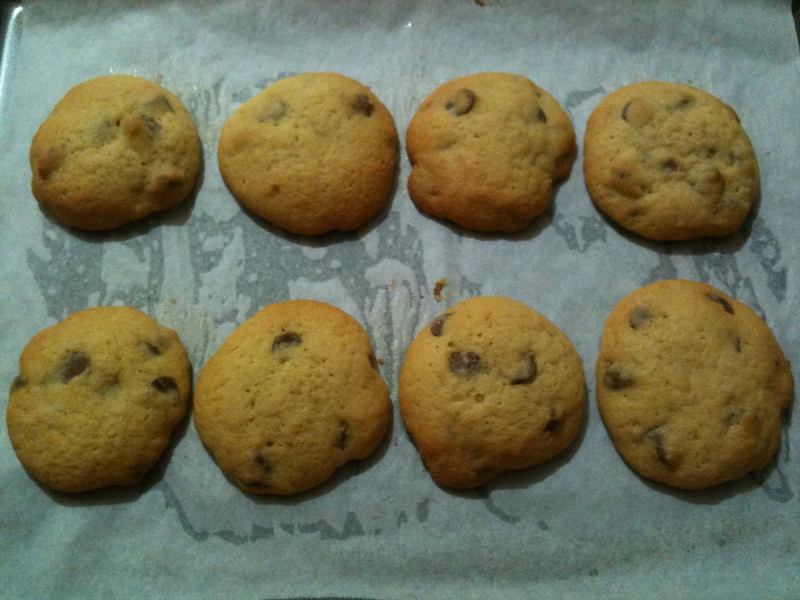 These are soft Chocolate Chip Cookies they don't come out crunchy but they are incredibly delicious. 1. Pre-heat oven to 175 C. Line a cookie tray with baking paper. 2. In a large bowl, cream together margarine, brown sugar and white sugar until light and fluffy. 3. Add egg beating well then stir in vanilla. 4. Sift flour and bi-carb soda then add salt and stir into creamed mixture. 6. Place rounded spoonfuls onto biscuit tray. 7. Bake for 8 - 10 minutes until lightly brown. Then move to cooling rack and enjoy.